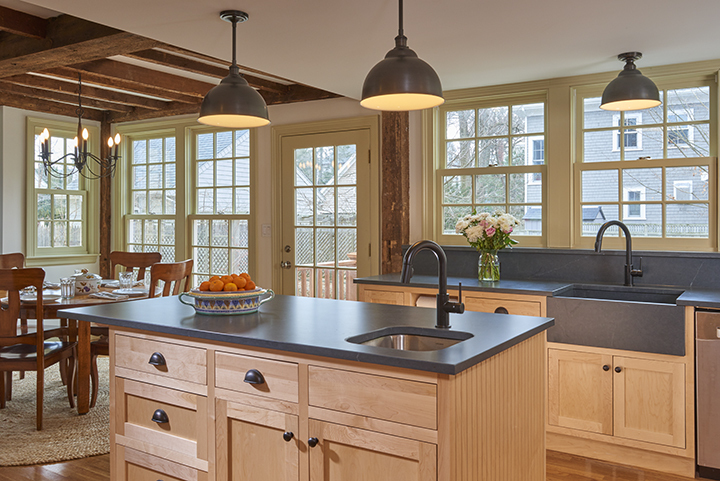 We recently finished a complete kitchen renovation in a charming 1780 historic colonial home in Newton. Architecturally, the strong bones of the home have beautifully stood the test of time, but the kitchen was extremely old and tired. The white cabinetry and laminate flooring had become worn out and dated, and countertop space was limited. Inadequate lighting made the space feel more dreary. 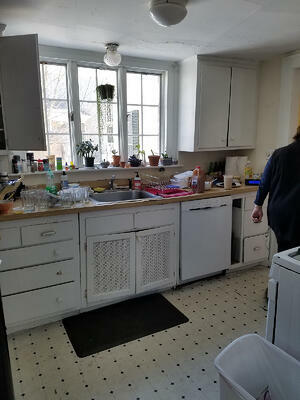 Overall, the kitchen space was small and cramped, without much storage, which was a scenario that wasn’t serving the needs of the homeowners once they came back to the US to live. The couple loves to cook and enjoys hosting frequent dinner parties. They also relish time with their adult children, who also like to cook, when they’re able to come home from college. So the homeowners wanted the space to be better designed for multiple cooks, with plenty of storage and lighting and inviting for guests. To make the space more functional, we added an island with a sink and cabinet storage space to create a second work triangle.This gives the family more workstations as well as a space to pull up a stool and visit. In addition, adding a pantry created valuable space for small appliances and dry food, which helped overall storage options significantly. 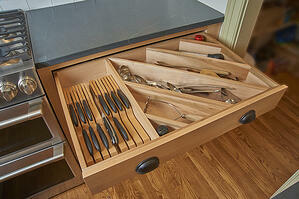 Storage space can be enhanced in smaller ways, too. Built-in open shelving at the end of the kitchen sink countertop adds a convenient and unobtrusive nook to store items that might normally clutter the countertop. Details like a custom-made drawer for knives and utensils and a paper towel holder inset into the lower cabinet near the sink also save space while boosting organization. Floor to ceiling natural maple cabinets increase storage space as well, and aesthetically they lend a warm, natural elegance. The shaker-style doors with flush insets create a clean, classic look that complements the style of the house. Paired with the light maple cabinets, the dark quartz countertops add sophistication and elegance to the overall kitchen design. The countertops are from Silestone’s Eternal Collection, and are made to look like charcoal soapstone but are actually quartz, which is more durable than soapstone. The custom quartz sink is not only visually appealing, it’s also resistant to stains, scratches, cracks, and heat since the quartz is nonporous. 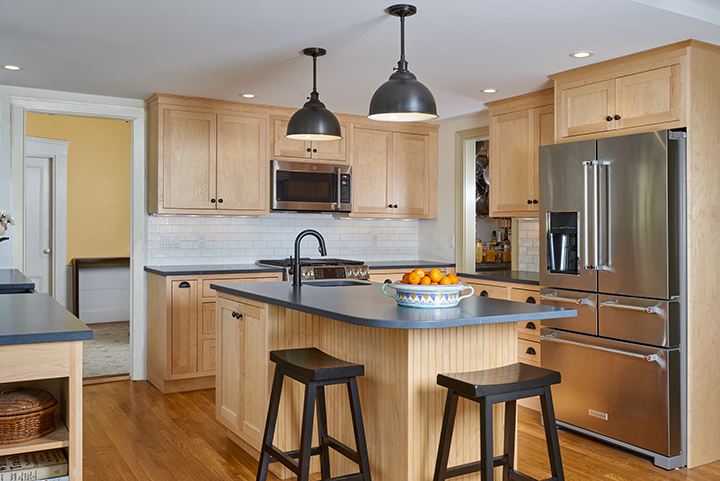 With the new kitchen design, the homeowners feel like fresh life has been breathed into their historic home. They’re finding that not only is it much easier to work in the kitchen, it’s now much more of a pleasurable time! Is your current kitchen meeting your needs? If not, come talk to us! Edesia Kitchen & Bath Studio is a Best Of Houzz award winner for client satisfaction in 2017, 2018, and 2019, and you can view some of our projects and reviews here. Take advantage of our free consultation and estimate by contacting us online, or by calling 781.238.8800.